Each year, the University Police prepares and distributes certain campus security, crime and personal safety information in compliance with The Jeanne Clery Disclosure of Campus Security Policy and Campus Crime Statistics Act. The information that pertains to FSU main campus students is presented as part of the FSU Policy Statement Booklet for Students, Faculty and Staff. Click to view an excerpt of the related pages (pdf format). 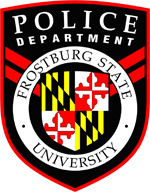 Frostburg State University Police Department assigns case numbers for all reportable activities, both criminal and non-criminal. Only case numbers generated for criminal activity are listed in a crime log in chronological order. Hard copies of the Crime Log are available for review at the University Police Headquarters. The disclosure of crime statistics is not a recent development at FSU. The University Police Department submits a monthly Uniform Crime Report to the Maryland State Police, and has done so since 1967. The following charts reflect the number of crimes and arrests for the past three years. Crime and arrest data are complied by the University Police Department from their own records and those of allied police agencies, and by canvassing other campus security authorities.